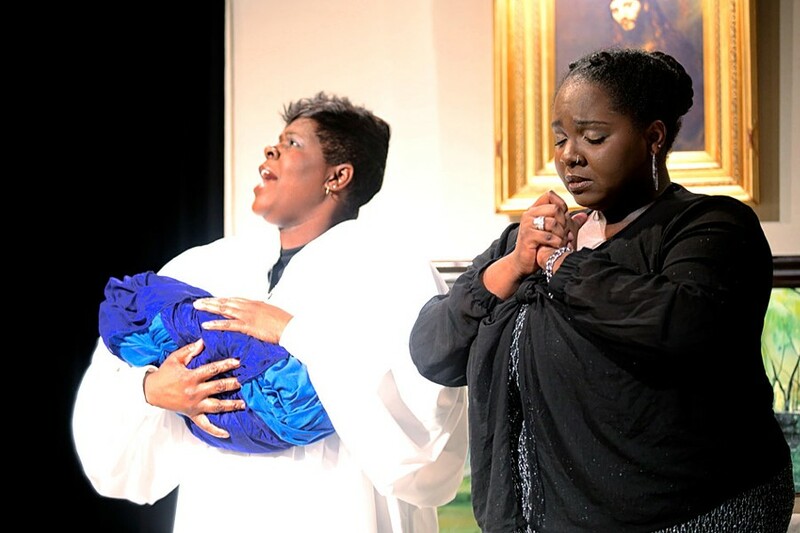 James Baldwin's "The Amen Corner," performed by the North Star Players under the direction of David Shakes, opened at MuCCC (142 Atlantic Avenue) on Tuesday evening. Between moving monologues, well-navigated layers of moral ambiguity, and singing that will give you goosebumps, this production is community theater at its finest. Through the course of the play, Baldwin unpacks the many complexities and conflicts riding the members of a family and a small congregation of a storefront church. Themes include an estranged husband, a struggling mother, a son spreading his wings, and the ways a "bully pulpit" can be used as leverage rather than true leadership. And it's ultimately about crucial struggle to love people through the worst of everything; the play preaches that love will be the thing that delivers us. Deborah Solomon as Margaret in James Baldwin's "The Amen Corner." 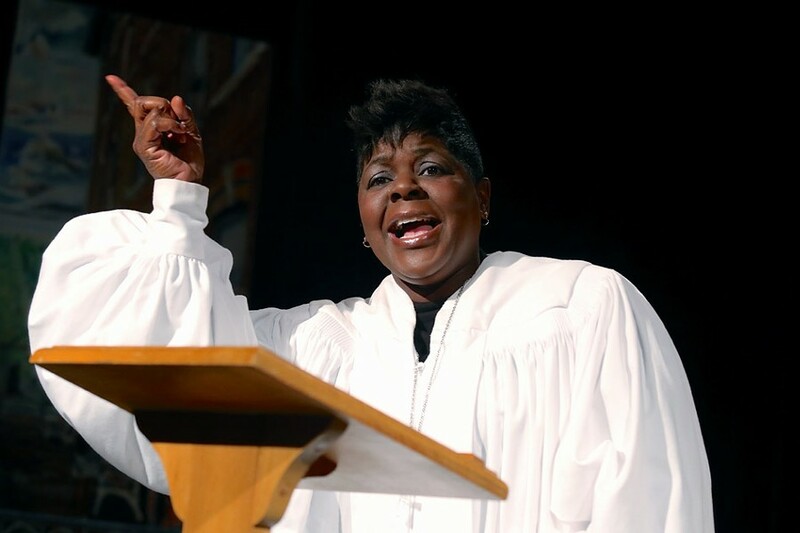 In short, "The Amen Corner" follows the story of a beloved pastor, Margaret (Deborah Solomon), who has raised her son, David (James Kates), largely alone, and whips her congregation into holy order through energetic sermons. She asks them to lead purely righteous lives, leaving no room for moral half-stepping even where it concerns means of survival or support of a fallen family. Early on, Baldwin provides a hint about the damning secret Margaret harbors, when she cavalierly suggests that Mrs. Jackson (Whitney M. Randall), whose infant is gravely ill and whose husband is disinterested in the church, leave said husband. The sudden reappearance of Margaret's dying husband Luke (Tremell Hale) sets in motion her steady fall from grace. A damning revelation creates doubt within her congregation, and she is accused of hypocrisy and worse. What follows is Solomon's engaging performance of Margaret's stubborn pushback against these developments, and her retreat into the cold refuge of her holy mantle. Kates quickens his formerly obedient yet cagey David with a palpable struggle to express his ideas to his domineering mother. And the various players portraying members of the critical congregation are a welcome source of mirth, with their excellently executed expressions, clever mannerisms, and subtle asides, in an otherwise heavy tale. Margaret (Deborah Solomon) comforts Mrs. Jackson (Whitney M. Randall), whose baby is sick. In one particularly catalyzing conversation between estranged father and son, it is revealed to us the event -- one that we can easily imagine would rend even the closest of couples -- that set each parent on their current path. Hale plays a world-weary and patient Luke who is frank about his own faults, but encourages his son to follow his heart. It wasn't music that led to his downfall, Luke claims, but the loss of his family. Hale and Kates expertly convey the brutally awkward and cuttingly earnest nature of the moment, in which father and son try to piece together what is left in the time that remains. "The Amen Corner" is semi-autobiographical. Baldwin wrote parts of himself into David, who epitomizes his experience in wrestling himself away from the church. Baldwin was a child preacher, but left the practice, and later the country, and spent his life honing his eloquence and arguments, and serving as a driving force in the background of the Civil Rights Movement. The evening wrapped with a discussion led by Thomas Warfield, assistant professor at NTID, which consisted of audience members weighing in on their reactions to the play, and cast members disclosing the various ways their characters' experiences mirrored their own. Though the play was written in 1954, and was a reflection on Baldwin's experiences from even earlier decades, the various themes of the role of religion and familial turmoil still feel immediate. "Baldwin wrote about ordinary people, but kind of tore them open," Warfield said. Performances continue each evening through Saturday, January 23, at 7:30 p.m. Following each performance, a talk back will be held, led by different members of the community. Tickets are $15 ($10 students) for Thursday through Saturday nights. A discussion and reflection with the cast will be held Monday, January 25, 1 p.m. at MuCCC (suggested donation $5 per family). For more information, call 866-811-4111 or visit muccc.org.